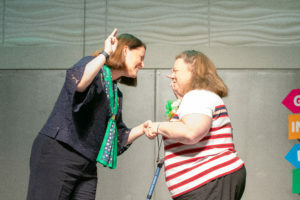 Girl Scouts – NC Coastal Pines CEO Lisa Jones presents a Distinguished Service Award to Mary Betts, a Johnston County Girl Scout volunteer, during the 12th annual meeting held in March in Greenville, NC. Girl Scouts – North Carolina Coastal Pines congratulates Mary Betts of Selma and Vivian Morgan of Clayton for receiving the Distinguished Service Award. They were awarded this prestigious honor at the Girl Scouts – North Carolina Coastal Pines 12th Annual Meeting held in March in Greenville, NC. The Distinguished Service Award recognizes those volunteers who have contributed remarkable service while partnering directly with girls in any pathway to implement the Girl Scout Leadership Experience through outstanding service in support of the council’s mission delivery to girl and adult members. The recipients of this award have performed beyond expectations for their position and have supported Girl Scouts’ mission delivery goals in one or more of the following functional areas: membership, development and community cultivation, volunteer relations and support, program, leadership, and council support service. Interested in joining these volunteers in building the future female leaders of tomorrow? Visit www.nccoastalpines.org to learn more about volunteering with Girl Scouts. We’re 2.5 million strong—more than 1.7 million girls and 750,000 adults who believe in the power of every G.I.R.L. (Go-getter, Innovator, Risk-taker, Leader)™ to change the world. Our extraordinary journey began more than 100 years ago with the original G.I.R.L., Juliette Gordon “Daisy” Low. On March 12, 1912, in Savannah, Georgia, she organized the very first Girl Scout troop, and every year since, we’ve honored her vision and legacy, building girls of courage, confidence, and character who make the world a better place. We’re the preeminent leadership development organization for girls. And with programs from coast to coast and across the globe, Girl Scouts offers every girl a chance to practice a lifetime of leadership, adventure, and success. 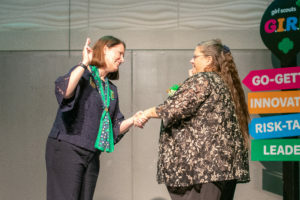 Girl Scouts – NC Coastal Pines CEO Lisa Jones presents a Distinguished Service Award to Vivian Morgan, a Johnston County Girl Scout volunteer, during the 12th annual meeting held in March in Greenville, NC. Girl Scouts – North Carolina Coastal Pines is largest girl-led leadership development program in central and eastern North Carolina, reaching nearly 26,000 girls and 9,000 adult volunteers across 41 central and eastern North Carolina counties. Girl Scouts helps develop leaders of tomorrow by empowering girls to take on bold challenges, discover their passions and strengths, and explore programming like STEM, entrepreneurship, environmental leadership, take-action projects, and global citizenship. Today’s Girl Scouts learn to lead with courage, confidence, and character to make their communities and the world a better place. The council’s administrative headquarters is located in Raleigh, with additional program and service centers located in Goldsboro, Fayetteville, and Wilmington. To volunteer, reconnect, donate, or join, visit www.nccoastalpines.org or call (800) 284-4475.